You'll be £19.99 closer to your next £10.00 credit when you purchase With Wellington's Outposts. What's this? John Vandeleur's letters home to his mother are a lively and engaging account of active service during the Napoleonic Wars, recounting everything from day-to-day life on campaign to the experience of pitched battle at Vitoria and Waterloo. As first a light infantryman and then a light cavalryman, Vandeleur was frequently on the outposts of Wellington's forces, in frequent contact with the French and often obliged to live a rough-and-ready lifestyle as a result. The conditions that he endured, and the camaraderie that sustained him, are vividly recounted in this fascinating collection – previously only available in an extremely rare private publication over a century ago. Expertly edited and enhanced with contemporary documents and commentary by Andrew Bamford, this is an outstanding contribution to our understanding of the Peninsular War and Waterloo campaign. This book is far more than a reprint of a Napoleonic memoir. Drawing on other sources, especially in National and Regimental archives, the author has produced a fully contextualised work that complements his previous book Gallantry and Discipline: The 12th Light Dragoons at War With Wellington. A model of how a first-hand account should be presented. The Vandelear family has produced a number of generations of soldiers and this book is a sensitively edited collection of letters written by one member of the family who served in both the Peninsular campaigns and at Waterloo. He also served as an aid to his relative Major General John Ormsby Vandelear. A valuable new view of the campaigns and battlers of Wellington from a junior officer. 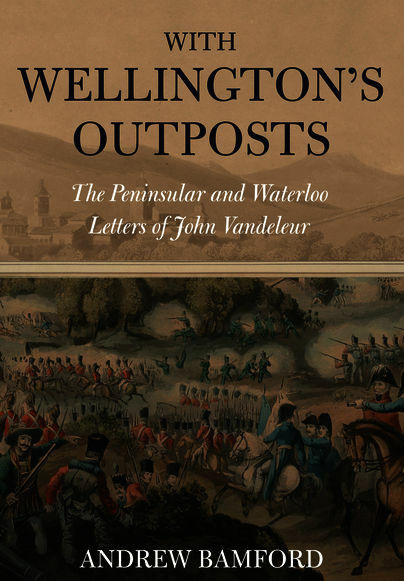 What makes these letters unique is that John Vandeleur wrote about his life, both in garrison and on campaign... With Wellington's Outposts is not a book about grand strategy or great events. Instead it tells the story of the daily life of a junior officer in the British Army in Peninsula and at Waterloo... An enjoyable read and because it is from the perspective of a junior officer it will appeal to those interested in the life of a soldier, regardless of the era, as well as those who study the British Army of the Napoleonic Wars. This book is a welcome addition to the numerous eyewitness accounts by British officers and men that collectors of such literature will certainly wish to add to their libraries. This gentleman's letters home to his parents provide a lively and engaging account of active service during the Napoleonic wars.